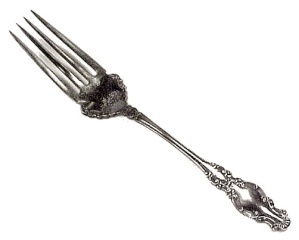 Wm Rogers Silver Plate Melrose Meat Fork Silverplate. Nice Meat Fork with Fancy Scrolls on Handle and a Floral Spray in the Bowl of the Fork. Measures approx 8.75 inches long. Very good condition with a little usage scratching on back side, needs polishing.